The QWERTY keyboard was designed 150 years ago, shaped by all the wrong reasons, and still masquerades as high tech when it is indeed a dinosaur. Ironically, it has been given an indefinite stay of execution thanks to the invention of the mouse, the lack of an obvious successor and a curious human resistance to change. Promising technologies such as handwriting recognition and voice recognition cried “ready” a few too many times before they really were and damaged consumer trust and … let’s just say that when we find a better way, we’re looking forward to a ceremonial burning of the keyboard. 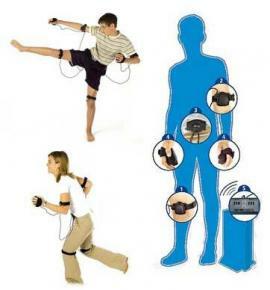 Logically, the computer can be interfaced with the human in many ways, and the BodyPad is a perfect example, as it turns body movements into computer inputs, effectively turning the human body into a Gamepad! BodyPad is a motion sensor game controller that works with Sony's Playstation 1 & 2 and Microsoft's XBox. Though it’s compatible with almost every existing video game, it’s ideal for fighting, dance games, and some sports games too! Indeed, a bit further down the track, we can see the BodyPad teaching us how to dance, box, throw a baseball, shoot a basketball or kick a football. Just imagine playing your favorite game with this equipment.